ESSEX teenager Louie Leighton praised his opponent’s sportsmanship after claiming the first leg of the Cuestars Under-21 Silver Tour on his debut. The newly-promoted 14-year-old fought back from 1-0 down to defeat Swindon’s Shane Kearns 2-1 in the final in Salisbury. “He called a few fouls (on himself) so it was sportsmanship,” acknowledged Leighton, who is based at Basildon Snooker Club. “But then I took advantage of it. 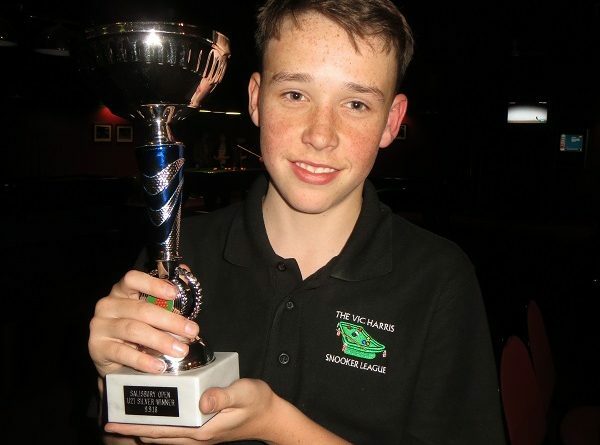 Leighton was undefeated in his four-man round-robin group at Salisbury Snooker Club. He dispatched his practice partner and clubmate Richard Hillgrove 2-1 in the last-eight and then denied Silver Tour stalwart Keegan Reed a first ever final appearance with a 2-0 victory in the semis. O’Shay Scott also won his group on his Silver debut. The nine-year-old from Eastleigh lost 2-1 to Kearns in the last-four after missing the final black on 46 for his first half-century to wrap up a 2-1 quarter-final victory over Brett Wallace (Gosport). Waterlooville Sports Bar hosts the second leg of ten on Sunday, October 7. Find out more about loft conversion specialists Attic Life at www.atticlife.co.uk. ROUND-ROBIN GROUP A: 1st, Harry Wilson (Waterlooville Sports Bar); 2nd, Brett Wallace (Fareham SC); 3rd, Kaine Petty (Salisbury SC); 4th, Callum White (Waterlooville Sports Bar); 5th, Oliver Cooper (Frames, Coulsdon). ROUND-ROBIN GROUP B: 1st, Shane Kearns (Jesters, Swindon); 2nd, Richard Hillgrove (Basildon SC); 3rd, Nat Kidner (Greenbaize, Bournemouth); 4th, Riley Ellis (147 SC, Swindon). ROUND-ROBIN GROUP C: 1st, O’Shay Scott (Chandlers Ford SC); 2nd, Keegan Reed (Salisbury SC); 3rd, Will Forster (Mayfair, Gosport); 4th, Dean Russell (Waterlooville Sports Bar). ROUND-ROBIN GROUP D: 1st, Louie Leighton (Basildon SC); 2nd, Samuel Laxton (Waterlooville Sports Bar); 3rd, Mason Wilson (Academy, Basingstoke); 4th, Zak Truscott (Waterlooville Sports Bar). QUARTER-FINALS (12 points): Reed 2-1 H Wilson, Leighton 2-1 Hillgrove, Kearns 2-1 Laxton, Scott 2-1 Wallace. SEMI-FINALS (15 points): Leighton 2-0 Reed, Kearns 2-1 Scott. FINAL (25/18 points): Leighton 2-1 Kearns.